We are recognized as a trustworthy Galvanised Hand Pallet Truck Manufacturer, Exporter and Supplier in Tamil Nadu. 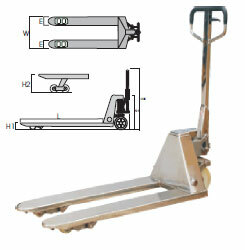 These Galvanised Hand Pallet Trucks are designed for special applications of transporting goods. The Galvanised Hand Pallet Truck is designed precisely by adopting quality methods and well-tested raw materials.